Yosemite is much more than a valley with 3000-foot rock walls and incredible climbing. It is an outlet for the energies of the world’s most passionate and adventurous people. Yosemite inspires the souls of climbers and non-climbers to reach for something beyond themselves and to travel to a place, physical and mental, where they have never been before. Few climbers can resist Yosemite; nearly every climber who has the opportunity to get to Yosemite manages to make the trip. At first, dont be surprised if you find yourself yelling down to your partner, This 5.9 feels like 5.11! The good news is that Yosemite climbs are within your grasp; they just take extra patience and resolve. Take solace in the fact that all new Yosemite climbers get humbled at some point but they eventually develop the subtle techniques necessary to move up Yosemite granite. The more time you spend on the rock and more technique you build, the more climbing opens up to you. Suddenly the thousand-foot-tall walls shrink a little and dont seem as daunting. Before too long youre planning your ascent of The Nose of El Cap. Unfortunately, there are few easy climbs to introduce you to Yosemite climbing. We scoured the Park to find every easy and moderate climb possible and put them in this book. However, there still isnt much at that end of the spectrum. If you are looking for 5.7 and easier climbs, be prepared to bunch up on a few crowded routes. Its not until 5.8 and harder that you really start getting options in Yosemite. If you cannot lead 5.8 or harder, its a good idea to climb with someone who is already familiar with the area and can give you pointers, set up topropes, and lead you up multi-pitch routes. Most climbing in Yosemite is traditional climbing where you climb cracks and place your own gear. Since Yosemite is not an ideal place to learn traditional climbing, have your gear placing, anchor-setting, and rope-managing skills dialed before visiting. Yosemite crack technique is difficult to learn. Your best bet is to start toproping the very lowest grades of cracks. Once familiar with the rock, try out some one-pitch leads and then move on to the multi-pitch climbs. Yosemite granite has many pin-scared cracks so a few sets of climbing nuts and offset nuts are essential. When a climbing cam is used, it is mostly in the thin to hand size (we'll warn you when bigger gear is needed in the guidebook!). For many of the longer routes, a LARGE number of slings are needed—it is common for pitches to wander. You will want a pair of comfortable climbing shoes for the longer routes and a tighter fitting slipper or velcro shoe for the sport climbing. A climbing helmet is a must for both potential loose rock and dropped gear from climbers above. A good supply of water is key, both for climbing days and for camping. Potable water is available at Camp 4 and any bathroom. If the route does not have a lot of chimney, I use a hydration pack. Good approach shoes or boots are strongly recommended for the often boulder-filled approach trails and descents. Sunscreen and sun hats for warmer periods, and warm gear and rain gear for anytime in the late fall through spring, where you can expect anything from hot periods to rain or snow. Don't forget the headlamp on multi-pitch routes, many people get hung up behind slow parties or take longer on the descent than they expect. A headlamp is essential to get down if it gets dark. A small knife is handy to remove old webbing at rappels. A cell phone could potentially save your partners life in an emergency. Here are a number of easier grade classic climbs that are often the focus of a climber's first week in Yosemite. We encourage you to check out the FREE SuperTopos we have available for download such as Snake Dike, Astroman, and The Nose. A selection of Yosemite's best classic climbs are contained in our Yosemite Valley Free Climbs  these are aesthetic and memorable climbs that climbers of any skill level will find worth repeating again and again. A great climb to introduce you to Yosemite granite. Three pitches of enjoyable climbing in the vicinity of Yosemite Falls. Great views of Half Dome and the Valley. Six pitches of enjoyable climbing. This route has been described as the world's most difficult 5.6. Great views of Sentinel, Cathedral Rocks, and Half Dome. A classic climb offering 15 pitches of 5.7 or easier climbing, with one 5.10.b section that can be aided. Great views of Half Dome, Yosemite Valley, and Glacier Point. A true Yosemite classic climb. Snake Dike winds its way up the southeast face of Yosemite's most renowned feature, Half Dome. Long approach, but great views and climbing. One of the best 5.8 hand cracks in the Valley. Located in the Church Bowl crag, which offers multiple short climbs from 5.4 to 5.11b. This is a climb you will do again and again. Six pitches of varied climbing including jams, stems, liebacks, and face climbing. Be careful of the runout crux. Commitment is one of Yosemite's best 5.9 3-pitch climbs. This route warms you up with two straightforward pitches, then blasts you with an intense and memorable crux. This is the tallest spire in North America and one of the most spectacular summits in Yosemite. This climb features unique and wild well-protected face climbing, a rare thing in valley full of cracks. Central Pillar of Frenzy is one of most popular 5.9 crack climbs in Yosemite. The route offers five pitches of excellent jamming with everything from fingers and stems to fist cracks and chimneys. 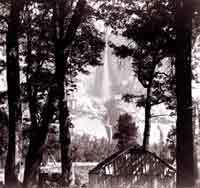 More than 100 climbing accidents occur every year in Yosemite. The information below may help you avoid one. The document below contains a number of tips that all big wall climbers should adhere to in order to keep Yosemite the climbing paradise it is today. Since 1997, the American Safe Climbing Assn. has replaced more than 1300 bolts in Yosemite Valley. While most popular climbs now have safe bolts, be aware that some bad bolts remain. View which routes the ASCA has replaced at the ASCA web site and please make a tax-deductible donation. Even a mere 5 dollars will replace at least one bolt. And that bad bolt could be the one that blows on somebody! Air Travel The closest major international airports are Oakland International and San Francisco International which are a 3.5-hour and 4-hour drive to Yosemite, respectively. Of the two, Oakland is preferred because it's less chaotic and 30 minutes closer to Yosemite. Sacramento International and San Jose International are also a 4-hour drive from Yosemite but connects to fewer airports. Fresno Yosemite International Airport is only a 3-hour drive but offers the fewest flights. Since all of these airports are about the same distance to Yosemite, shop around for the best fares. Some climbers also fly into Los Angeles International Airport, which is a 7-hour drive to Yosemite. All these airports offer car rentals. Train Travel The train is not the fastest way to Yosemite but its kinda cool. From Emeryville (a 20-minute bus ride from San Francisco) take Amtrak to Merced and board the YARTS Bus to Yosemite. The cost is around $25 round trip. From Los Angeles, Amtrak has a bus to Bakersfield that connects with a train to Merced. From there take the YARTS Bus to Yosemite. Bus Travel Short of having a car, the bus is the best way to get from a major airport to Yosemite. From Oakland, San Francisco, or Los Angeles take a Greyhound Bus to Merced, CA and then take the YARTS Bus to Yosemite. Plan a full day of travel if taking the bus. From June to November only, you can also reach Yosemite from Mammoth by the YARTS bus. Car Travel There are four state highways that access Yosemite: 120 from the west, 120 from the east (AKA The Tioga Road), 140, and 41. The fastest access from the San Francisco Bay Area is 120. Highway 140 is the best option if coming from Los Angeles or Fresno. Highway 140 is also the lowest elevation road and offers the best winter access if 120 and 41 have chain controls (chains are rarely required on 140). Highway 120 from the east (AKA The Tioga Road) offers the best access from Bishop, Utah, Nevada, and eastern states. However, this road closes after the first major winter storm (usually in November) and doesn't open until the snow melts (usually late May). View a list of opening and closing dates for the Tioga Road/120 since 1980. To access Yosemite from the east in winter, you must get to the west side access roads by driving north through Tahoe or south through Bakersfield. Rent a car at any airport or major city. International climbers who stay in the United States for more than a month often buy a cheap used car in San Francisco or Los Angeles and sell it (or scrap it) at the end of their trip. To get a cheap car, look in the local papers or www.craigslist.org. Many people stay in Yosemite without a car. Renting a car is expensive and it's possible to reach most climbs by the free shuttle bus. However, the shuttle does not serve areas west of Camp 4, including: El Capitan, Leaning Tower, Cookie Cliff, and Reeds Pinnacle. To reach these areas without a car you will need to hitchhike or ride a bike. Yosemite has some of the best weather of any climbing area in the United States. Because the climbs start from elevations between 2800-7500 feet, there is usually some place with good climbing temperatures throughout the year. Spring and fall have the best climbing weather. Summer cragging is usually uncomfortably hot but the long routes can be cool enough. Winter can have good climbing weather but can also have months of uniquely wet and severe Sierra storms. A dry November is our favorite time in Yosemite--perfect temps in the sun and no crowds. Before you plan your climb, make sure you check the NPS Raptor Closure Page. The climbing closures change yearly depending on where the peregrine falcons nest in the spring. Nov.March The Valley empties of both climbers and tourists, which brings a pristine feeling to both the climbs and Yosemite in general. During this time there is usually an even mixture of clear and stormy days. Most of the long routes at higher elevations are too wet or cold, but there are many sunny and dry cragging areas, mainly west of the Highways 140/120 junction in Lower Merced Canyon. When bad weather rolls in, things get nasty real quick. Pacific storms usually bring three days of heavy snow or rain but can last up to a week or longer. Usually it only takes a day for most sunny crags to dry out after a storm. If a two-week storm system rolls in, it's time to ski or snowboard at Badger Pass in Yosemite or head to Joshua Tree. If camping in the Valley during the winter, prepare for long cold nights. AprilMay 15 Walls and the Valley are still uncrowded. It's warmer, but there is the same 50/50 chance of getting either good or miserable weather. If you are traveling from far away this is a risky time to visit, especially with a week or less of vacation. Most of the long climbs are still too wet or cold, but the crags are dry. May 15June Perfect weather and big crowds of both tourists and climbers. Long days make this a great time to do a lengthy multi-pitch route. JulyAug. The Valley is still crowded with tourists, but the climbs are uncrowded as most people head to Tuolumne for cooler weather. While Valley floor temperatures are often in the 90s and 100s, temperatures on the walls 500 feet above the Valley are usually comfortable in the 70s and low 80s. Prepare for the heat with plenty of extra water. Sept.Oct. The Valley is crowded with tourists and climbers. The weather is generally perfect except for the occasional lingering heat wave. The first winter storm usually arrives in late October or early November. Weather forecasts on the web often vary significantly. Our favorite forecast is listed below but you may want to check all of them. It's also a good idea to look at the live web cams. Yosemite Valley weather — SuperTopo's favorite forecast. Contrary to image of the pristine nature park, Yosemite Valley is a small tourist town filled with buildings, roads, cars, and people. The bad news is that the many buildings, restaurants, stores and motel-like rooms take away from the natural beauty of the park. The good news is that these same things make the Valley damn accommodating. You will find restaurants, groceries, climbing gear, a medical clinic, motels, swimming pools, rafts, bike rentals and, if you find yourself in an unfortunate situation, a jail. 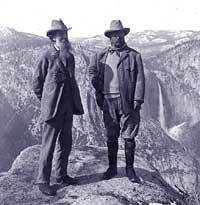 Lots of links to travel information can be found at the Yosemite Area Traveler Information site. 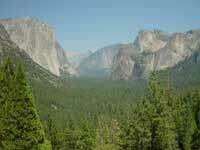 Here is a great informational site geared specifically towards Yosemite climbers. Also this link will take you directly to the park's website on climbing. There is a 30-night camping limit within Yosemite National Park in a calendar year; however, May 1 - September 15, the camping limit in Yosemite is 14 nights, and only seven of those nights can be in Yosemite Valley or Wawona. Camp 4 is the historic center of American climbing. It is also Yosemite's only walk-in campground and the cheapest place to stay. No reservations are required, but during peak season (May– October) expect a long wait to secure a campsite. The cost is $6 per person per night with a 7 day limit on your stay. Each site is a patch of dirt 20'x20' with a fire pit and a picnic table. Each site holds six people and if there are fewer than six people in your group you will share the site with others. There is a bathroom and a sink in the middle of the campground, but no warm water or showers. A bulletin board next to the Ranger Kiosk offers the chance to find climbing partners, friends, and used climbing gear. Here are all the Yosemite campgrounds. Call (800) 436-PARK to make reservations for other campsites or make reservations online. There are a variety of places to camp outside the park boundary. Check out the Forest Service web site for more info. In addition to campsites, there are more plush accommodations available in Yosemite. If you are ready to pay the big bucks, you can stay at the lovely Majestic Yosemite Hotel, or for a more modest price you can crash in a motel-like room at Yosemite Valley Lodge or a canvas topped cabin in Half Dome Village. Also, a selection of vacation homes are located just minutes out of the Valley in Foresta (with views of the summit of El Capitan and Half Dome!). In the summertime your best bet is to make reservations well in advance of your visit. Hilltop cabins offers great winter rates. Groceries are available in the Valley at the Village Store, Curry Village Store or Lodge Store. It is much cheaper to buy groceries in Oakdale, Merced or Oakhurst on the drive to Yosemite. "The Cafe" (cafeteria), The Mountain Room (moderate priced American food), Mountain Room Bar and Grill. Showers cost $5 (towel included) and are available at Housekeeping or Half Dome Village. Laundry is available at housekeeping. Half Dome Village Gift & Grocery (209) 372-8396), located in Half Dome Village, offers a large selection of climbing and camping gear at reasonable prices. They also have a knowledgeable staff that may know the latest beta on some climbs. You can get climbing instruction, arrange for a guide, and also rent gear from the Yosemite Mountaineering School and Guide Service. There are also a dozen climbing shops in the San Francisco Bay Area where you can purchase gear. If you need to purchase a bunch of gear, its hard to beat Berkeley (10 miles east of San Francisco) where there are four good retail locations within a 2-mile radius: Berkeley Ironworks, and REI. If you are coming from the east side of the Sierra, then visit Wilson's Eastside Sports in Bishop or Mammoth Mountaineering Supply in Mammoth, both of which have an extensive selection of rock climbing and mountaineering gear. Bears have damaged cars for as little as a stick of gum or an empty soda can. If you want whats yours to remain yours, remember three things about bears: they are hungry, smart, and strong. When bears smell food, even if its locked in your trunk or glove compartment, they shift into high gear. They get turned on by odors of containers that used to contain food, but do no longer. They even go for toothpaste and sunscreen. Bears dont even need to smell food; they see something like a grocery bag or an ice chest, and associate it with food. In fact, they dont even need to see that much. If a bear notices clutter inside a car, hell think, I wonder whats under all that stuff? and go to work. Breaking into a car is a trivial exercise for a bear. He inserts his claws at the top of the door frame and pulls down. Then he climbs in and trashes the car. You cant outsmart or out-muscle a bear. The only safe place for your food is in one of the bear-proof storage lockers provided by the Park Service at all campgrounds and some parking lots. 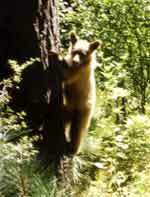 For more information check out the Park Service's bear page and weekly bear bulletin. Poison Oak occurs sporadically throughout the Valley, especially in the Lower Merced Canyon west of the 120/140 junction. Find someone to show you what it looks like and be especially careful in the winter when poison oak loses its leaves and is difficult to see. Should you or your partner get hurt while climbing, cell phones shorten the rescue response time. However, cell phone in the outdoors are annoying so keep them away except for emergencies. Cell phone coverage in Yosemite in spotty. There is generally decent reception between El Cap Meadow and Half Dome Village. As you gain elevation on a climb, the reception often improves. West of El Capitan the coverage deteriorates quickly and dies completely west of the Highway 120/140 junction. A good number to have programmed on your phone is the road and weather report: (209) 372 0200. What do you do when Valley temperatures hit the 90's? Head for the water. Rent rafts from Half Dome Village and float down the Merced River or just dip into the water next to El Capitan Meadow. If you are willing to drive 40 minutes, there are two great swimming holes outside of the Park boundaries. About ten miles west of the Highway 120 entrance station, take a left immediately after a large bridge. Here you will have your choice of jumping off 15-25' cliffs or just kicking back next to the water. About 15 miles west of the Highway 140 entrance station is the Octagon, which features a rope swing, sketchy cliff and tree jumps and great spots to kick back and have a BBQ. 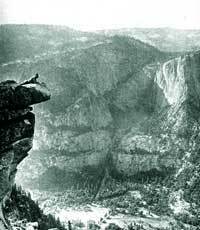 The directions to this place are more devious so you will have to hunt down a local Yosemite climber for info. In winter, when the Valley is too snowy, go ice skating at Half Dome Village or head to Badger Pass for some skiing or snowboarding. There are also a number of neat exhibits in the Valley such as the Indian Museum, Visitor Center, and the Ansel Adams Gallery. 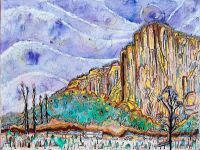 Yosemite Big Wall Obscurities - This free download includes hand drawn topos of obscure Yosemite big walls. Yosemite Big Walls - The most detailed and informative guide to Yosemite's most popular big walls. Yosemite Valley Free Climbs - The most detailed and informative guide to Yosemite's most popular free climbs.